Now here’s a Miner bee! 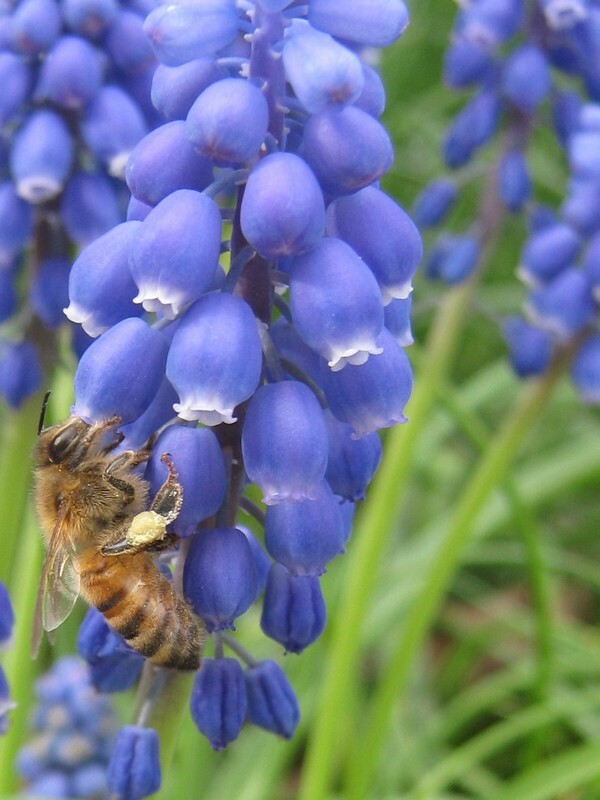 In spring you may see lots of little bees emerging from the ground or your lawn. 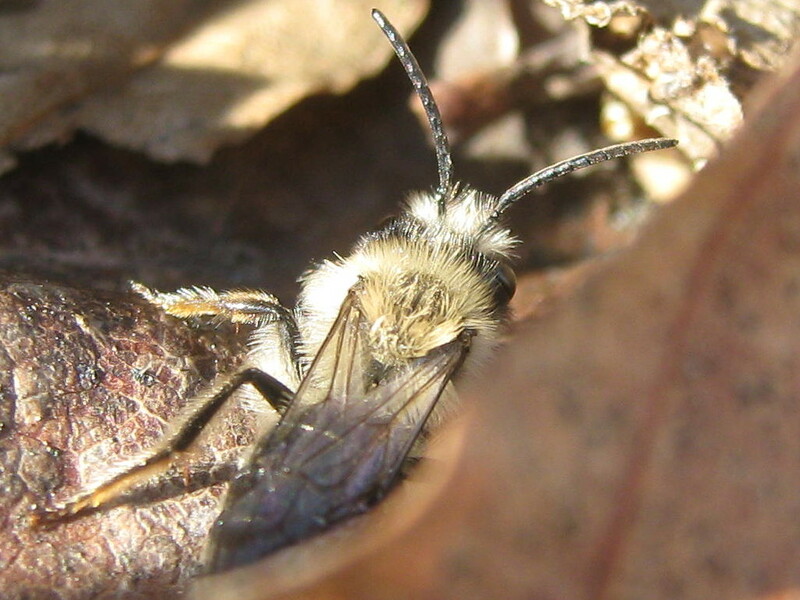 The ones I find are little brown Early Miner Bees. First are groups of them zooming around. These are the males, who emerge first. Next come lone bees hunting around on the ground. These are usually the females looking for their nests, or good places to dig one. Or you may well find them in the trees, pollinating flowers. This Sunday, May 11, from 1:30 pm to 5:00 pm. I’m participating in the Watertown Chemical-Free Garden Tour. This is a semiannual garden tour featuring yards and gardens where no chemicals have been used for at least a year. Needless to say, eschewing chemicals and pesticides is vital for all bees. In this tour, many of the gardeners are featuring what else we are doing for bees, from planting flowers to keeping hives and offering bee hotels. My garden is a stop on the tour. With the delayed spring, it’s looking nicer than it usually does in May. The bulbs are still open in full force and the pear trees are flowering. Honeybees are visiting, Miner Bees are stocking their tunnels, bumblebees are searching for nesting sites, and my annual male Carpenter Bee is patrolling his usual spot by the door. He may even try to get in your face as you come up the stairs. But don’t let his bluster fool you: unless you’re also a bee, he can’t do anything to you. Hope you can come see some bees! Are the bees coming out? Not a bee, but a saw fly. Last week, I saw a bumblebee go by a window, and dashed out to see where she was going. 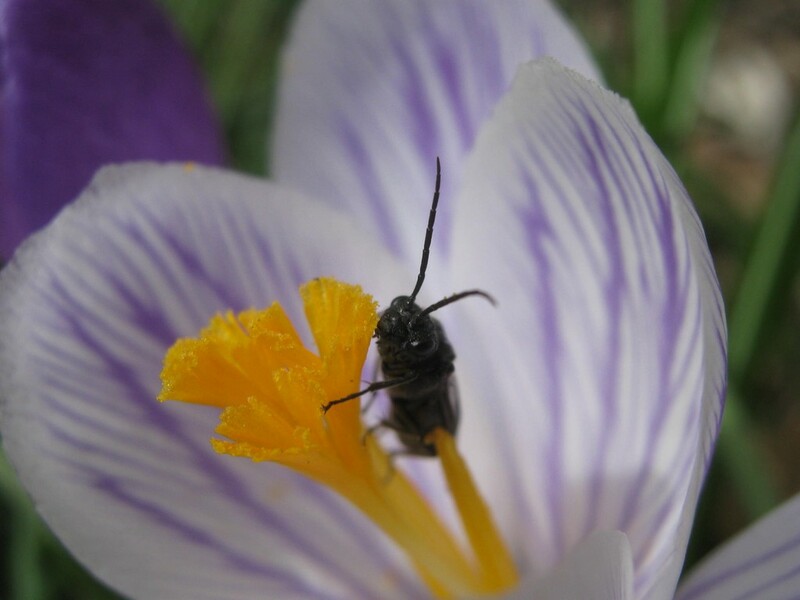 I missed her, but I did find this bee-like bug, resting on the stamen of a crocus flower. It had a cute little face and long antennae like a bee, but it didn’t seem all that interested in pollen. Could it be a bee? Our first event, showing “Vanishing of the Bees” at the Watertown Library has been RESCHEDULED! on Tuesday May 6 from 6:00 PM to 9:00 PM. We’ll have a honey tasting, an informative discussion, and a movie, Vanishing of the Bees. This Agapostemon bee has something to say. 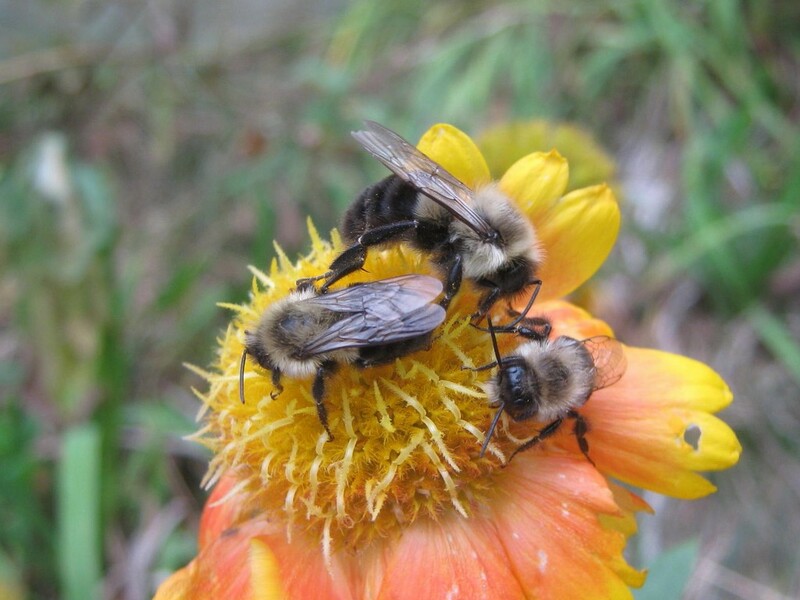 As I mentioned before, last Valentine’s Day Home Depot and Lowe’s were swarmed by bee-lovers asking them to stop selling neonicotinoids and plants treated with them. The good news is that Home Depot is working on doing better. The bad news is that Lowes won’t even say that they’re not changing anything. 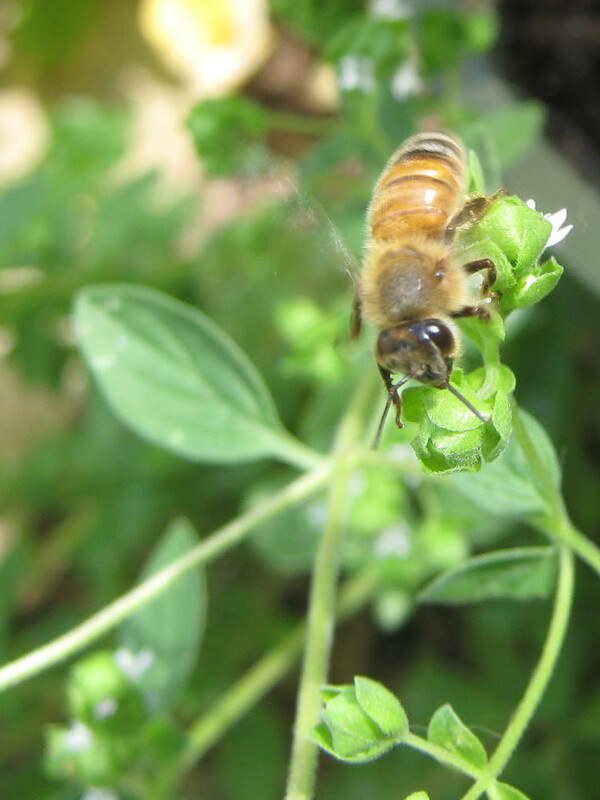 When I first heard about the decline of the honeybee, I started paying more attention to the bees in my yard. To my relief, I saw that honeybees still came to visit. And of course there were bumblebees. Then I noticed these beautiful little shiny green insects, and they turned out to be bees too! 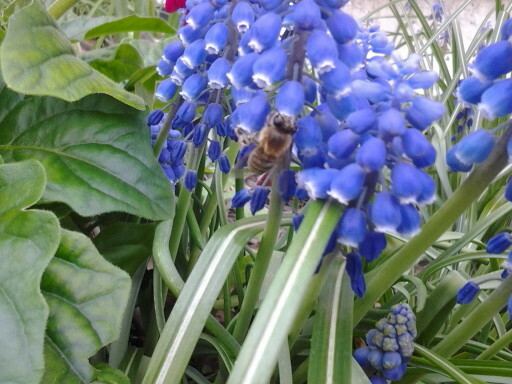 I had no idea there were so many species of bees, just in my garden. By taking photos and posting them to BugGuide, I soon discovered a dozen different kinds of bees. 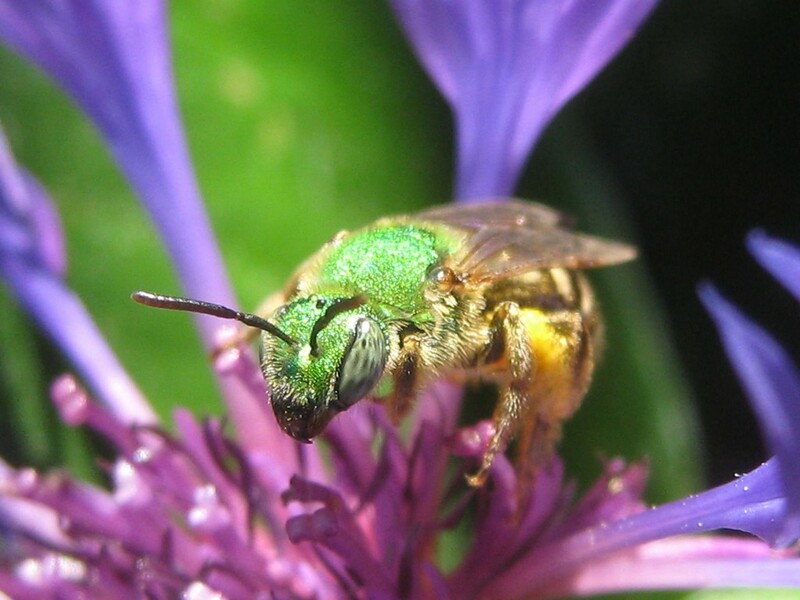 There’s honeybees, and bumblebees, jewel-like green Agapostemon bees, black long-horned Melissodes bees, Squash bees, Early Miner bees, Carpenter bees, Small Carpenter bees, Wool Carder bees, Leaf Cutter bees, Halictid sweat bees, and Lasioglossum sweat bees. And Cuckoo bees, so that’s a baker’s dozen.